As I explained in this week's issue of the print magazine, the resilience of Obama's "new coalition" of upscale whites and minorities has allowed Obama to remain competitive in North Carolina, a state that voted for him by just 14,000 votes in 2008. It also augurs poorly for Romney in Virginia, an extremely similar state where the same forces keeping North Carolina close might just keep Virginia in the Democratic column. Obama’s Virginia coalition might be the most resilient of any battleground state. National and state polls confirm that Obama remains strong among college-educated whites and minorities, even while bleeding considerable support among white working class voters (whites without a college degree). Although these losses endanger Obama’s chances in the Midwest and nationally, Obama is less dependent on working class whites in Virginia than any other battleground state. Only 18 percent of Obama’s supporters were whites without a college degree and nearly half of Obama’s supporters were non-white. 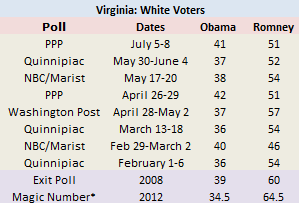 The state polling confirms that Obama has suffered relatively minor losses among whites in Virginia. While Obama’s share of the white vote has dropped by about five percentage points nationally, it is not entirely clear that Obama has lost any white support at all in the Commonwealth. Most significantly, he holds a high enough share of the white vote to secure the state, provided a repeat performance among non-white voters. The worst part for Romney? He might not even be taking advantage of the few available opportunities. According to Quinnipiac, Obama holds his 2008 supporters among both college educated and non-college educated whites, even though national polls suggest that Obama ought to have faltered among non-college whites. Although I’m skeptical of the importance of state economies, Virginia’s unemployment rate is among the lowest in the country and that could be responsible for Obama’s unusual endurance among white working class Virginians. This also complicates the argument that Obama’s unusually wealthy coalition might falter under the weight of attacks on Bain Capital or tax policy. Indeed, Quinnipiac shows Obama at or above 2008-levels among voters in households making more than $100,000/year in Virginia. If Obama is doing so well among white voters in Virginia, why isn’t he leading in the polls? The polls showing Obama leading by 7 or 8 points tend to show Obama faring extremely well with African Americans, while the closer polls either show diminished black support for Obama or assume that African Americans represent a smaller share of the electorate. For instance, while the recent Quinnipiac and Washington Post polls both show Obama with 37 percent of the white vote, Obama has a staggering 97 percent of the African American vote in the Washington Post poll, but just 82 percent in the Quinnipiac poll. African Americans made up just 17 percent of the Virginia electorate in the Quinnipiac poll, compared to 20 percent in 2008. As a result, Obama holds 51 percent of the vote in the Washington Post poll compared to just 47 percent in Quinnipiac. Either way, the Romney campaign would probably prefer that their chances weren’t dependent on meaningful declines in African American turnout and support for the President. Population growth and subtle changes in the composition of the Democratic coalition pushed Virginia toward Democrats over the last decade. But Virginia’s well documented lurch toward the Democrats actually fell slightly short: Obama won Virginia by 6.2 percent in 2008, making it slightly more Republican than the nation as a whole. While the traditionally Republican state might be expected to tilt toward Romney, Virginia may be poised to tilt Democratic for the first time in 64 years, provided that the election stays close nationally. Here's the simple formulation: If Virginia whites only offer slightly less support for the President than the rest of the country, then the state's much larger African American population and smaller white population are sure to nudge the state to the left of the national mean. Without Virginia's electoral votes, Romney's path to the Presidency gets narrow. So long as Romney struggles to make gains among college educated whites and minorities, his campaign team might be wise to consider alternative paths to 270. Follow me on twitter @electionate or at the Electionate blog.